Since I literally poured a bottle of glitter on my nails I used two coats of "Ready for Takeoff" peel-off base coat by Unt, because I definitely don't want to have to remove all that glitter with nail polish remover. I've recently bought this peel off base coat because I read some amazing reviews, but it didn't work for me at first. I tried a couple different methods like rubbing cuticle oil on my nail before applying, removing any oil on my nails using polish remover, applying another base coat first, but none of them seemed to make the polish "pop-off" my nail like I'd read in so many reviews. Then I tried using 2 thick coats, letting the first one dry completely before applying the second, and that actually makes removal easy! So if you're one of those rare people, if we're going by online reviews, for who this base coat doesn't work as expected, try 2 or 3 coats. For the accent nail I applied two coats of "Neo-Noir" by H&M and a coat of "Insta-Dri" by Sally Hansen. Then I painted on the text using gold liquitex acrylic paint and a 3/0 Raphael Kolinsky brush. For the matte look I used "Silk Matt" top coat by Catrice Cosmetics. 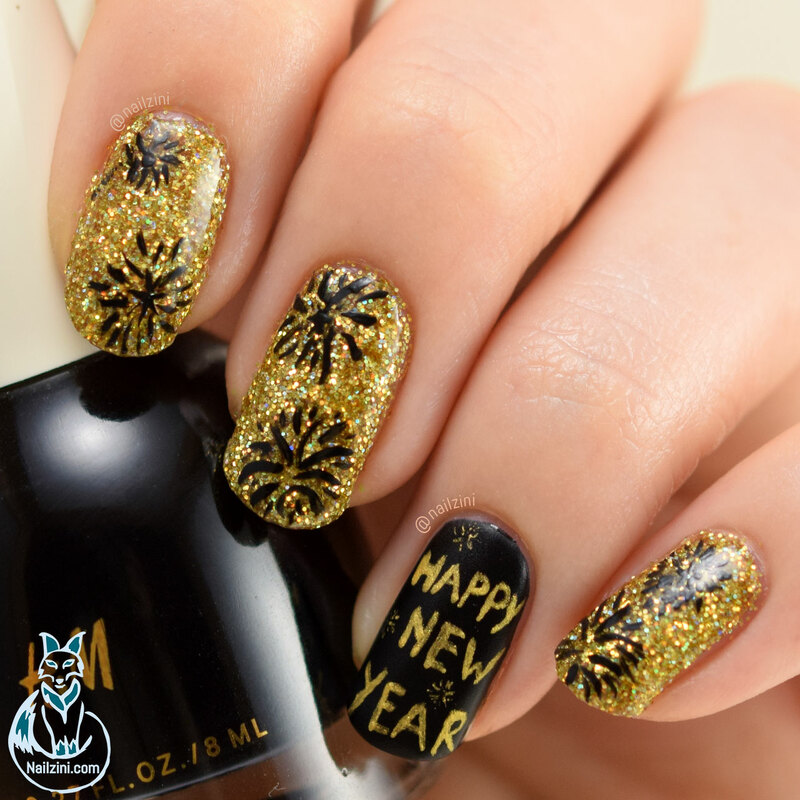 The base of the firework nails is gold holographic glitters from a craft store. 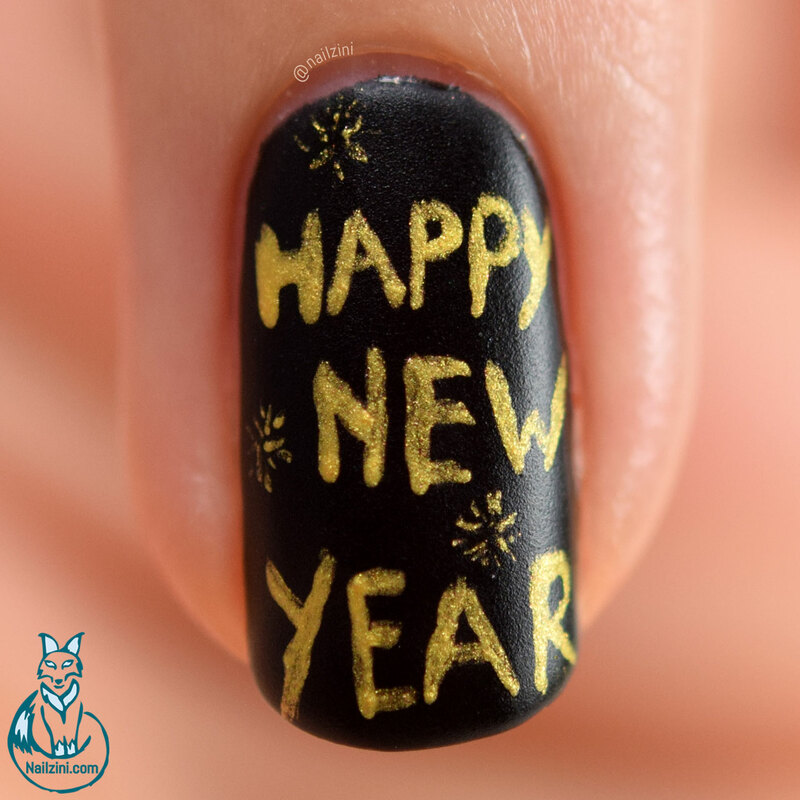 I first applied one coat of gel look top coat by Catrice Cosmetics, any not fast-drying top coat will work for this, and then poured the glitter on top. Use a fan brush to gently remove the excess glitter on your nails and skin. Wait a minute or so and then apply a top coat. In total I applied 5 layers of top coat to make the surface completely smooth so it's easier to paint on. 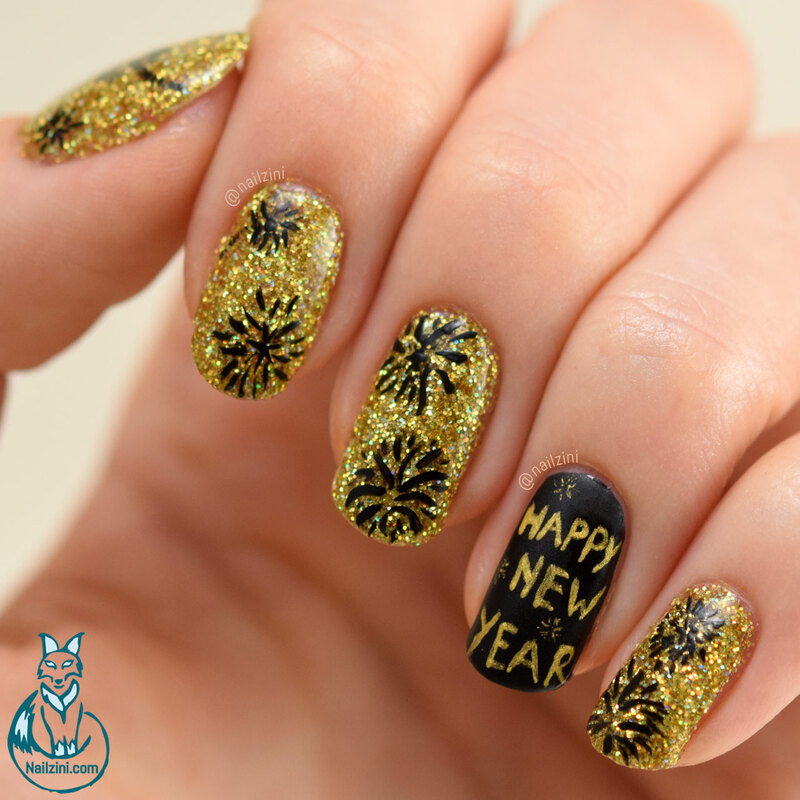 The fireworks are hand painted using black Jo Sonja's acrylic paint and the "Tartofraises roubloff detail 00" brush by Adnails Manucure.